SINGAPORE, Oct 16, 2015 – EDMI Limited has been recognized with the 2015 Frost & Sullivan Company of the Year award in Singapore Smart Meters Industry. “By introducing products or services that are unique and in the best interest of the market, a business can experience significant increases in its customer base. Within the Singaporean smart meters industry, EDMI has been constantly pushing the envelope in terms of innovation in its services,” said Mr. Chua Kar Pin, Research Associate, Best Practices Division, Asia Pacific at Frost & Sullivan. He also said that the Singapore smart meters market has been tightly contested, with top participants competing aggressively for a share of the booming market. “EDMI, as one of the top participants, has demonstrated its adoption of best practices and is constantly in the forefront in terms of keeping up with technological evolutions and innovations in products and services,” he added. “We are honored to receive the Company of the Year award in Singapore Smart Meters Industry from Frost & Sullivan, a reputable consulting firm,” said Mr. Lee Kwang Mong, Group Managing Director at EDMI Limited. “The award is a validation of our work in the smart meters industry in Singapore. We remained committed to deliver excellence in the smart meters industry in Singapore,” he added. 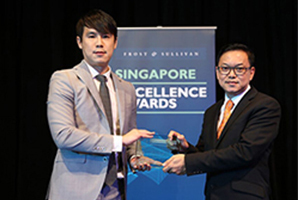 The recipients of the 2015 Frost & Sullivan Singapore Excellence Awards were identified based on an in-depth research conducted by Frost & Sullivan’s analysts. The award categories offered each year are carefully reviewed and evaluated to reflect the current market landscape and include new emerging trends.